I recently realized that I had not had beef stroganoff in a very long time and I wanted to try making it. According to the wikipedia beef stroganoff is a Russian dish consisting of beef in a sour cream sauce. My mother made this a few times while I was growing up and I remembered really enjoying it. I searched the net for some recipes though I already had an outline in mind. I knew that there would be some onions and mushrooms in addition to the beef. One idea that I did come across was to add paprika and although I had never had it that way, it sounded like a great idea. The paprika and mushroom combination reminded me of a mushroom soup that I had made a while ago and really enjoyed. That soup combined mushrooms, sour cream, paprika and dill and I had really like the flavour combo so I decided to add some dill to the stroganoff as well. I added some dried dill while the sauce was simmering and some fresh dill just at the end for the best of both worlds. I figured that there were two main ways that I could cook the beef. I could either get a really tender cut of beef and quickly saute it or I could get a much cheaper cut of beef and braise it until is was nice and tender. Since I had the time and I really enjoy braising I decided to go with that route, though there is a quicker option if you are short on time. While I was rummaging through my fridge I came across some bacon and I decided to throw it in as well to kick up the flavour a bit. I also sauteed the beef in the bacon grease so as to not waste any of that flavour. I then let the beef simmer in the sauce until it was fall apart tender. The beef stroganoff was amazing! It was so full of flavour that only got better the next day. The beef was nice and tender and it seemed to just melt in your mouth. The sauce was nice and creamy and tasty and I really enjoyed the mushroom, paprika, dill and sour cream flavour combination. I served the beef stroganoff on egg noodles though you could use any type of pasta or rice, etc. I am looking forward to making this again! Cook the bacon in the pan over medium heat and set aside. Saute the beef in the bacon grease until it is no longer pink, about 5 minutes and set aside. Add the bacon, beef, stock, tomato paste, paprika, dill, salt and pepper and bring to a boil. Reduce the heat, cover and simmer until the meat is tender, about 60-90 minutes. Mix the flour into the stock and stir it into the beef. Bring to a boil and cook while stirring until it has thickened, about 2-3 minutes. Option: For One-Pan: Make this a one-pan meal by adding 8 ounces of pasta and 2 1/4 cups broth or water (or 1 cup of rice and 2 cups broth or water) to the sauce in step 9 and simmer, covered, until cooked, about 12 minutes (or 20 minutes for rice). Take a look at the Presto Pasta Nights roundup on Once Upon a Feast. This looks really appetizing! Beef and mushrooms and paprika already sounds so good! This looks excellent…I might try it with some lamb stew meat I’ve got in the freezer! This looks tasty. I had stroganoff in a restaurant a little while ago and it didn’t look as good as the one you made. Looks great Kevin! Stroganoff is definitely one of my favourite dishes. Beef stroganoff is one of my favorites. I’ve never had it without paprika and mushrooms and onions. The sauce looks so luscious! Looks great. How many servings does the recipe yield? yum! I love the addition of mushrooms n spices in this too. Ah, I didn’t know it has to be a sour cream sauce. Usually people here just combine a cream of mushroom soup with beef and noodles, heh heh 🙂 Looks delicious! This looks spicy and tempting..And adding those mushrooms can give an extra flavour…feel like having some..
That’s a dish I really love! Yours looks scrumptious! How funny! I haven’t had stroganoff in years, and then my aunt served it Friday night (she uses the Joy of Cooking recipe) and you posted on it today. Yours looks really good! I seldom see this in the menu over here…. We love beef stroganoff here! The first time I had it my former MIL made it and I’ve made it myself ever since! great looking stroganoff, kevin! such a comforting dish, always. Anonymous: I got 4 generous serving from it. Looks so homey nestled in those buttery looking noodles. Paprika and beef are so good together. Yes! I haven’t had beef stroganoff in a long time either. I am definitely going to go make it soon. Yours looks delish – all you need is a bottle of wine.. I subscribe via reader so I rarely comment but I absolutely love your site. Every recipe of yours I’ve tried has been a complete success. Well done. Also, great pictures. You are making me so hungry now, Kevin! I have spare ribs planned for tonight, but I am craving this now! YOu can never go wrong with a good stroganoff! Your beef stroganoff looks good. I never cared for this growing up and haven’t had it in years but your looks tempting. I just might try it again! This stroganoff takes me back to my childhood where we had hearty chuncks of beef and creamy sauce on top of fluffy egg noodles. I agree, this is one of my favorite dishes for wintertime. I love using those really wide egg noodles. Looks good! That looks really tasty, I havent made it in a really long time either! I heard this dish a lot, but never made it. It looks so irresistible, Kevin! WOw i love the colour. I didn’t know they added bacon in it. yum! this is a great recipe for one of my favorite comfort foods. impressive! How excellent to have found some bacon in the fridge! Great post, it is simply delicious – thanks for sharing! i love beef stroganoff. it is just so, so, so good. oh i meant to say, you should try it with smoked paprika! This is a great lookin’ Stroganoff Kevin! I haven’t made this in such a long time either. I really like the addition of the tablespoon of paprika! 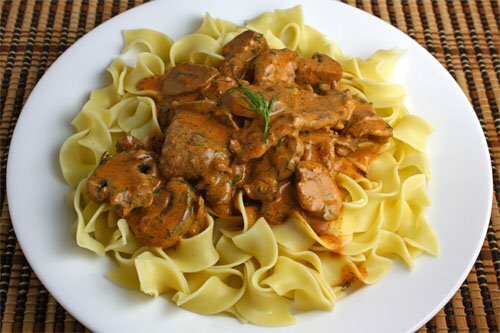 I love stroganoff – this looks really delicious Kevin. I love dishes that get better the next day! That looks delicious – I love the sound of paprika, dill, tender beef and noodles! This looks really great and comforting Kevin! Looks yummy. I have got to try this! Thanks for sharing such a delicious dish with Presto Pasta Nights. This one is particularly awesome. It is looks delicious. I should put this on my to-do list. My husband cannot eat rich foods anymore due to his serious digestive issues and his massive weight gain. But I still can (and do). I plan to make this for Christmas dinner!! My husband will eat something else, unless I figure out a way to use fat free ingredients. A wonderful old dish. Your version is especially appealing. You did a nice job making the old new again. Bookmarking!! This looks so good! Funny that you posted this – I have been craving Stroganoff and have made both a chicken and a vegetarian version over the past 2 weeks. The sour cream and the paprika are just indispendible to give it the required taste. Yum! I keep coming back to your blog because it is so welcoming – great text, photos and recipes of course. I am going to use the stroganoff recipe for my annual dinner I make for my employees and families. I trust that your recipes will carry the evening. Keep cooking – you have a happy audience here in Berkeley California. A Russian chef told us he makes it with full-fat Greek yogurt (no sugar)instead of sour cream. OMG! This looks amazing! I love that you decided to simmer it until the beef was super tender. Just discovered your blog, and I have to say, as a fellow food blogger cooking in a closet-sized kitchen, I salute you! Love the photos! Hello, I’m from St.-Petersburg, Russia. In St.Petersburg there is a palace where duke Stroganov lived. We often cook Stroganoff at home, it was one of the first dishes mother tought me to make when I was a teenager. At home I always cook it with sour cream – Russians like sour cream! We don’t add paprika, but it’s possible. What is NOT in Russian traditionn – to serve it over noodles! We love potatoes, so in a Russian restaurant or at somebody’s home they would serve it with mashed or fried or country style or whatever cooked potatoes! I made this for my family tonight…it was AWESOME!! ^^ Everybody loved it and my dad went back for more. Thanks for sharing this. A very tasty dish – Will make again! this was wonderful. i will be making it again. I already had a Stroganoff recipe, but I needed to get rid of some fresh dill, so I used yours. It was great, much better than my old one! Thanks! This is my most favourite recipe for Stroganoff! Could it it daily – I make mine with Austrian "Spaetzle" and they fit so well! 😀 Thanks Kevin!